Zina Gribble Jensen, 89 passed away peacefully at her daughter’s home Monday, September 18, 2017 after a short bout with brain cancer. Zina was born in Gunnison, Utah to James Bertram and Daveda Olsen Gribble on September 24, 1928. 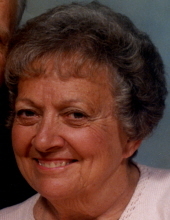 She attended school in Gunnison, graduating in 1946. On July 16 1948 she married her sweetheart and next-door neighbor of 11 years, H. DeVon Jensen for time and all eternity in the Manti Utah LDS Temple. Their first home was in Gunnison where Steve was born, thenthey moved to Richfield where Susan was born. They next moved to Pocatello, Idaho and then back to Gunnison where Mike and Julie were born. They remained there until 1964 when they moved to Nampa where they built their dream home complete with a beautiful yard and large garden, and where they resided the remainder of their lives. Her yard and garden were her passion and many family, friends and neighbors were the beneficiaries of her gardening skills. She was also an expert seamstress and operated a custom drapery and home décor business from home. She had a deep and abiding testimony of the atonement of Jesus Christ and was a dedicated member of The Church of Jesus Christ of Latter-day Saints, where she served in numerous callings in all of the auxiliaries of the church. Zina and DeVon served two missions for the church. The first was a full-time mission in the Alaska Anchorage Mission and then subsequently a church service mission in the Idaho Boise Mission. They also enjoyed serving together as ordinance workers in the Boise Idaho LDS Temple. She was a devoted mother, grandmother and great-grandmother. At the time of her death, her posterity numbered 4 children, 23 grandchildren and 49 great-grandchildren. They will all long remember holiday traditions, large Sunday dinners, work parties, Warm Lake vacations and grandmotherly counsel and advice. Coincidentally, after having been counseled to serve a full-time mission, her eldest great-grandchild, Emily Seable received her call just hours after grandma’s passing. During their life together, she was a stalwart support of DeVon’s professional, civic and church undertakings. Later in life, she cared for his every need during a 7 year struggle with Lou Gehrig’s disease from which he passed away in 2010 after 62 years of marriage. Zina was preceded in death by her parents; a brother John and two sisters, Helen Louise and Eris; and a son in-law, Robert Noble. She is survived by her 4 children and their spouses: Steve (Jone) Jensen, Susan Noble, Mike (Kit) Jensen and Julie (Barrie) McKay. Contributions may be made to the Nampa 19th Ward missionary fund c/o Bishop Daniel Lister, 227 Sunrise Rim, Nampa, ID 83686.